A perfect pair of breast is considered one of he most attractive and appealing physical features of a women. However, sometimes, due to hormonal changes , obesity, pregnancy, breastfeeding and side effects of certain medication, breast becomes oversize or too large, not only look ugly but also spoil your entire figure and causes a lot of embarrassment. In addition to spoil your physical figure , too larger breast causes many problems including sweating and rashes under the breasts, shortness of breath, tenderness, back pain, and neck pain. Cardio Exercise is one of the best ways to naturally reduce your breast size. 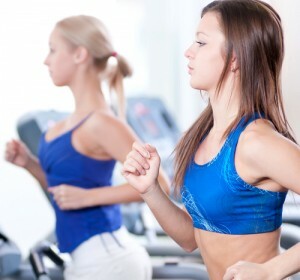 Cardio exercise not only reduce your unwanted excess breast fat but also help a lot to burn overall excessive fat.To avoid breast jerking and further stretching, before cardio exercise don't forget to wear a proper fitting supporting bra.Running, jogging, brisk walking, swimming, cycling are best examples of cardio exercises. 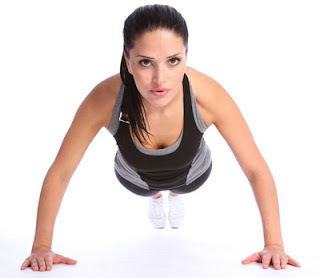 Push Ups Exercise not only strengthen your arms but also tighten the muscles beneath the breast and help to reduce the excess fats in breast. (1)To perform Push ups simply lie flat on the floor with your hands next to your shoulders. (2)Push yourself up onto your knees. (3)Pull in your stomach muscles and keep your body in a straight line. (4)Lower yourself back down to the ground and just before your body touches the ground push yourself back up. (5)Repeat in 3 sets, 10 reps in each set. (1)Using light weights, lie flat on a workout bench, keeping your feet flat on the ground. (2)Hold the weights directly over your chest with your elbows bent at 90 degrees. (3)Slowly press your arms straight up, but don’t lock your elbows, keep them soft. (5)Slowly lower your arms back down to the starting position. (6)Repeat this in 3 sets and 10 reps in each set. (1)Using light weights, lie flat on a workout bench, keeping your feet firmly on the ground. (2)Hold the weights up in the air above your chest with your palms facing in. (3)Slowly lower the weights out to the side in an arc movement with your elbows slightly bent. (4)Stop at shoulder level and hold for a moment. (5)Slowly raise your arms back to the starting position. Dumbbell back pullover exercise not only helps to reduce and tone your breast but also strengthens your chest muscles and triceps, located on the back of your upper. (1)Using a light weight dumbbell, stand with your legs shoulder width apart. (2)Hold the dumbbell with your both hands above your head. (3)Slowly lower the dumbbell behind your head as far as you are comfortable. (4)Hold for a moment and slowly lift the weight back up to the starting position. (5)Repeat this in 3 sets and 10 reps in each set. Incline Presses Exercise works on the muscle that is beneath the breast and help to lift your breast, make them tight and look visibly reduced. (1)To do incline presses effectively, use a steady incline bench and dumbbells. (2)Lie with your back straight against the bench. 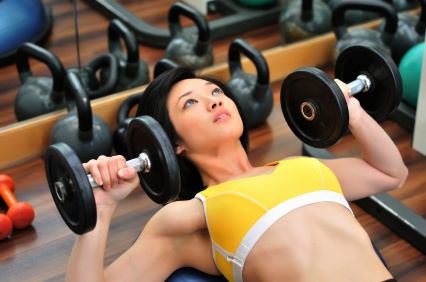 (3)Hold the dumbbells out above your head, with your arms extended until they are straight. (4)Bring the dumbbells down back toward your chest and repeat. (5)Repeat this exercise 10 times and do 3 sets with time interval of 30-60 seconds. 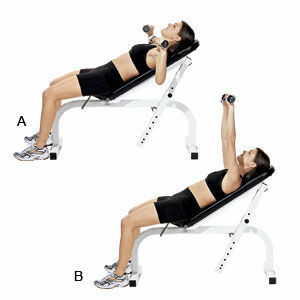 You can tone and reduce the breast with decline presses. To carry out decline presses. Use dumbbells and a decline bench. (1)Lie down with your back flat on the decline bench. (2)Hold the dumbbells firmly in both hands. (3)Stretch both arms up in the air. (4)Lower your arms down gently until they are by your sides. (5)Repeat this process until you have done 10 repetitions. Do 3 sets with time interval of 30-60 seconds.